The Fern and Mossery: Easy Hanging Gardens and Terrariums? Easy Hanging Gardens and Terrariums? Thinking vertically can be a great boon to would-be gardeners with a shortage of gardening space. 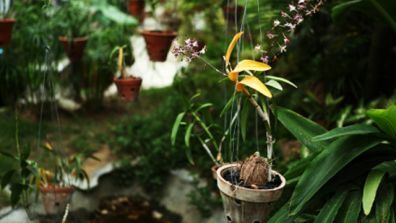 Hanging potted plants are a great option for those restricted to balconies or small yards. This Fox News article Easy Hanging Garden Ideas also suggests hanging terrariums to maximize impact. I have seen some lovely teardrop terraria hung from overhead lighting or even christmas trees. I also know some 70s-era terrarium crafters applied that other notorious 70s craft (macrame) to arrangements in order to suspend large containers from ceilings. Have you tried hanging terrariums in your home? Does it work out as a long-term presentation option?